Protein Microarray Buffer Kit for activating, reacting, washing and rinsing PlasmaScan™ 80 Antibody Microarrays and all other protein microarrays. 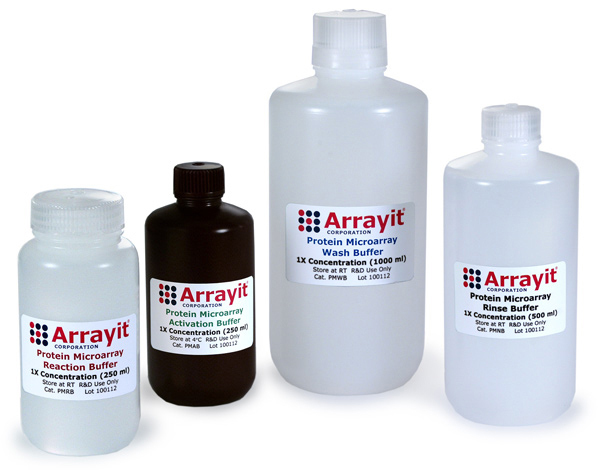 Arrayit Protein Microarray Buffers can be used for microarrays of antibodies, antigens, peptides, cell extracts, and others. Arrayit PMBK is supplied as 0.1 µm filtered solutions, ready to use, store at 4°C or room temperature as instructed.